Santi is a lecturer, researcher, media literacy activist, and advocate of No Smoking Campaign. 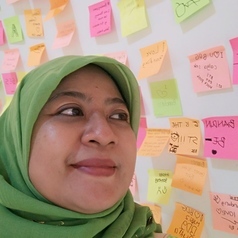 She lives in Bandung and teaches Research Methodology, Media Studies, Radio Journalism and Media Literacy at Mass Communication Faculty in Universitas Islam Bandung since 1998. In 2006 she established Bandung School of Communication Studies (BASCOMMS). In 2015 Santi created Smoke Free Bandung campaign. In 2017 she joined Digital Literacy Advocates Network (JAPELIDI). She writes popular articles in several newspapers like Kompas, Pikiran Rakyat, and Sindo and scholarly articles in journals. Her book on radio journalism, Jurnalisme Radio: Teori dan Praktik, was published in 2010. She loves traveling, reading, writing and knitting.